What are Human Rights anyway? What are the oldest examples of Human Rights Codes? Magna Carta (1215)...forced on King John by rebellious nobles. What human rights do we have? What rights can the government not take away under any circumstances? What are positive and negative rights? Brainstorm some examples of positive and negative rights. 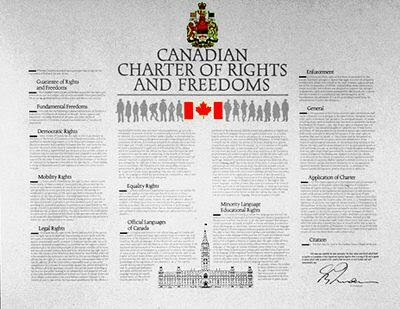 What's the Charter of Rights and Freedoms? What rights are in other constitutions? What rights do these have in common? What rights should be enshrined in our constitution? What else? Do some brainstorming. If you've been paying attention, you'll have noticed that supposedly unchangeable rights can change a lot from country to country. Even over time rights change. At one time, women couldn't vote. At one time, gays couldn't marry. Now that's not true in Canada, though in many countries women still can't vote and gays still can't marry. So what rights are eternal, or at least what rights should always be rights from a Biblical point of view? From a Christian point of view, what things should we be allowed to do, always and forever? Using the rights you've brainstormed, draw up a Christian Charter of Rights and Freedoms . What are the top ten rights/freedoms that a government must protect when seen from a Christian point of view? These should be rights that a government can enforce. While you may think the Bible gives us a right to be loved, for example, the government cannot make anyone love anyone else. Type these up neatly and ornately like an official government document. Be prepared to defend your choice of rights from a Christian point of view. Just because it's interesting, a Wordle with all the Words from the Charter, the Bill, and the Declaration (courtesy of Sam K).